A: Player Checks back, performs a prefake and then gets faced up as quickly as possible using either 1) a self pass or 2) a quick turn taking it into a side gate and then weaves through cones using designated foot. Explodes to Cone, gets around it and makes an accurate pass back to his support (partner). Coaching Points: 1) Explain need for getting faced up quickly. 2) Teach when/how to do a pre-fake. 3) Teach a quick turn. 4) Only allow these moves today as many will want to do something tricky that will result in a turn over. Emphasize keeping the ball. 5) Keep the ball close while weaving, longer touch when exploding into space. 6) ACCURATE pass to partner&apos;s feet. 7) Coach ways to increase speed of play 8) Active rest for players. 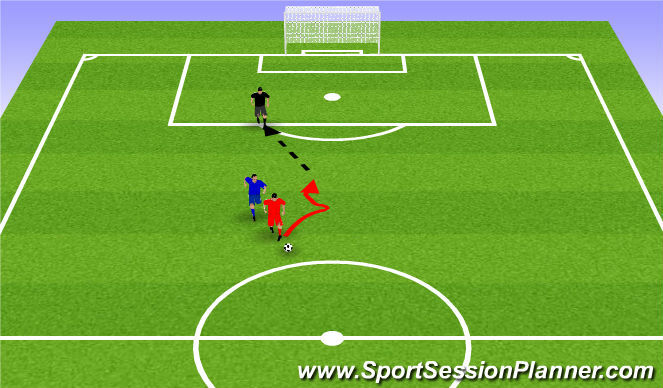 C. Player will simulate dribbling at speed and having to turn out of eventual pressure (Cone). 1 Partners will go for 60s only using a Cruyff. Cruyff Must be performed correctly. Cut with R/L, next touch with opposite foot keeping the body b/t ball and defender. Next touch must be played back to his support (partner). The player that passed the ball will simulate pressure while the receiver takes his first touch out of pressure. At each middle cone, the player MUST perform a hesitation and then acceleration into their Cruyff. Switch moves after each group works for 60s. Next add a cut with the outside of the foot. Keeping body between ball and defender. Pass made with his other foot. Coaching Points: 1) Teach how to dribble with speed with the outside of foot. 2) Demonstrate a proper Cruyff/Outside of the foot chop/cut. 3) Body kept between ball and defender will help us retain possession, 4) ACCURATE pass to support&apos;s feet. 5) Coach ways to increase speed of play 6) Active rest for partner. 7) Teach vision of reciever to take EXPLOSIVE touch out of pressure. "The game is often won in the trenches, where these 1v1 battles are fought. It HAS to take more than 1 of them to take the ball from us. They must be able to break individual pressure...they do this through shielding and escaping." Shielding (Maybe King of the Ring): 5x5 Box, 30 Sec. A) 1 player is designated offense, other D. If D wins the ball, that player will get it back into grid as soon as possible. B) 30 Sec whoever has the ball at the end wins. C) Coaches will start the game by rolling the ball in and letting the players work on their initial physical contact before arriving at the ball. Coaching Points: Players must be able to hold someone off while staying composed mentally and physically on the ball 1) Stay Composed. Welcome the contact. Be brave on the ball. 2) Sideways stance to create distance b/t ball and defender. 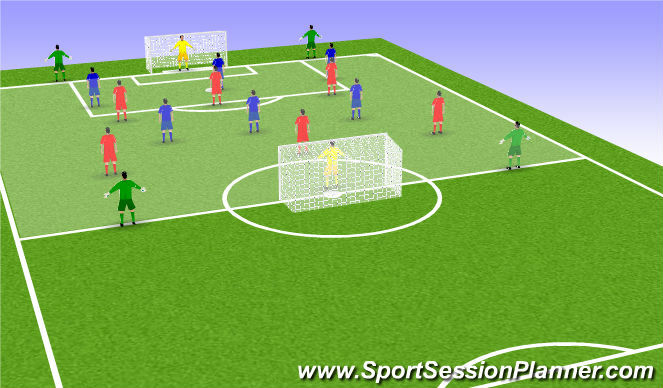 3) Feel the defender 4) This is a shielding exercise, not an escaping exercise. 5) This should be very physical without "fouling." 6) Manipulate the ball as needed. Escape Tunnel&apos;s: Here we will teach the kids how to recieve the ball, under pressure, stay composed on the ball and escape into avaliable space to break pressure. Groups of 6. 10x15yds 1 group at a time. Attacking Player starts with the ball between her feet and the defender on her back. The D player pokes the ball b/t her legs into the middle of the grid to start the game. The Att wins by dribbling through a gate on the end line. The D wins if the ball leaves the grid. 3) He doesn&apos;t have to touch the ball everytime he moves. He can fake one way and leave the ball where it is and go back to it as he explodes out of his move. 4) Stay composed! Be brave and strong on the ball. 4) Move to the next more game like progression. Balls now come from a service into the grid, on the ground, in the air, bouncing, etc... Coach will serve the ball in. A: 1 V 1 + T. The grid is 20x10. 1 minute. Inside the grid it&apos;s 1v1. Outside the grid are 2 Targets that can not enter grid. Targets are 2 touch and must stay active to create open passing seams to support the player on the ball. Again, they have 2 touches to return the ball to that player. 1 player will start as the Att. He gets a point for everytime he gets the ball to the opposite target player. He CAN pass the ball back to the target player that he got the ball from for 1 point but then must go the the other Target player to get another point. If the D win the ball, he now becomes that Att. C: Jamaica Drill: Each set of players iare given a number. 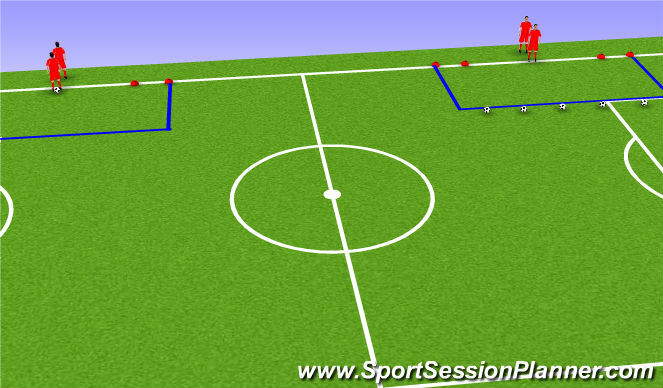 As soon as the coach plays a ball out he will call a number and the 2 numbers will engage in a 1v1 battle to goal. The attackers remain on the field until the coach calls a different number. Coaching Points: 1) Encourage the attacker to break pressure and advance the ball ASAP. 2) He must then quickly get in support of the Target. 3) Composure on the ball. 4) How crafty can they be to break pressure w/o giving the ball up? 5) Progression: A) Targets CAN play to each other. B) Targets are 1 touch to increase the ATT player&apos;s urgency to support the Target. B: 2 v 2 + T: Same rules as above. Coaching Points: 1) Same as above. 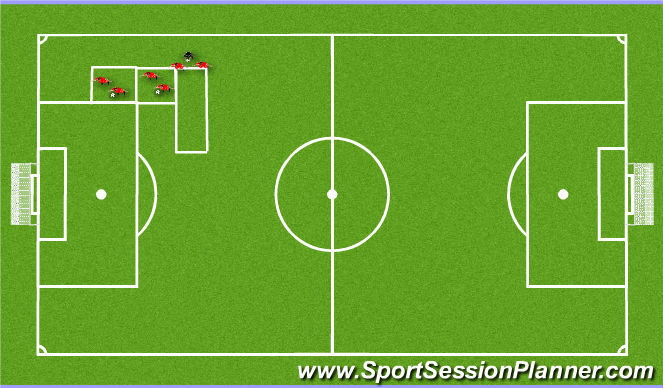 2) How can 1 Att&apos;s run open up space for the other attacker to get the ball and advance it up the field? 3) Progression: The Att MUST play to the 2nd Att before they can go fwd. 8v8 to Goals: We will now progress to a more game like scenario. 5 minute games. No restrictions. 1 team will play in a 4-3-1. The other team will play in a 3-4-1. Coaching Points: 1) Is the player staying composed on the ball? Are they strong and brave while under pressure? 2) What are the players doing to escape pressure? 3) Are they conceding ground when they don&apos;t have to? 5) Are they getting in IMMEDIATE support of f the ball? This is a combination of shielding and escaping. No boundries. Groups of 3. 1 server, 1 attacker and 1 defender. A server plays a ball and the man that wins becomes the attacker and the other a defender. The attacker works to shield, escape and deliver the ball back to the attacker. The server then 1 touches a ball in another direction and the game continues for 45-90 seconds. If the defender wins the ball, he becomes the attacker. Whomever has the ball at the end of the time becomes the server and gets rest.